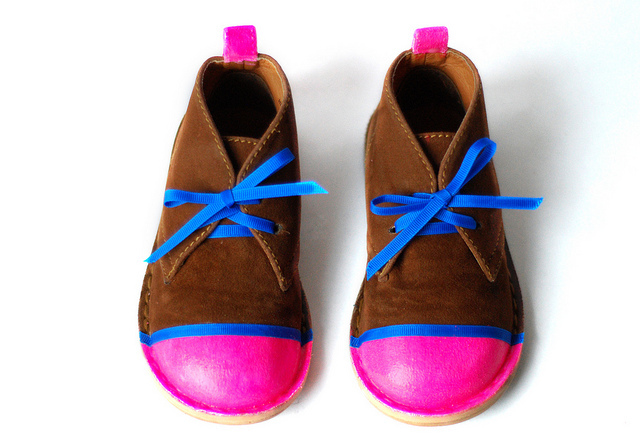 I first started following Celina when she did this Neon shoes tutorial for La Petite Mag. Then I noticed she is following me back. Then I entered a giveaway she posted about and WON. And only after all that I also realized she is a passionate KCWCer...or is it KCWCist? She is also extremely nice and has immaculate taste. What is a person with 2 million followers on pinterest even doing talking to me? I used to sew and create kids clothes as a livelyhood, after 8 years of doing so I've had to give it up and get a full time job. Just as I was about to start my new job, in May 2011, I discovered Elsie Marley's blog and her challenge and I was so excited to participate and keep my passion alive. So now, KCWC gives me a reason to keep on sewing, I hardly ever take the time to sew outside of this challenge, so I make a point of doing it. Also, my kids love it and are so proud to wear things I've made for them, that's my greatest source of motivation. And I have to say it's nice to be part of a little community as well and see what everyone is up to, I've met some pretty awesome people along the way. This year will be my fourth and not my last! The whole house knows something is up! I don't have a separate room to sew in, so my dinning room gets taken over and the whole house is a mess, but I wouldn't miss it for the world. Yes, once last spring. Lucky me! It was so exciting seeing my kids pj's being featured and I was very honored to be amongst some very talented mom's. Probably my organic pj's, I just love that my kids were part of the process, they choose the animals they wanted on their pajamas and then we made potato stamps and stamped the fabric together. I think it ended up being a great collaboration! I had to hide those pj's from them at some point, because it's all they ever wanted to wear, day & night! I really only sew for my kids now, my son is 5 year old and my daughter is 3. I love sewing for children, I find you can have so much fun with the the fabrics and styles, the possibilities are endless. And since I don't sew for a living anymore, I find it more relaxing and I can be more creative, more experimental, I don't have to please anybody else but me! Sometimes, I wish there was a week of sewing for me, I haven't made myself somethings in years. No, no one in particular. I like to go through the flickr group and admire the amount of talent out there, I'm always so surprised! Celina blogs over at Petit à Petit and family and Let's do sew and regularly contributes to Babyccino Kids and La Petite Mag.